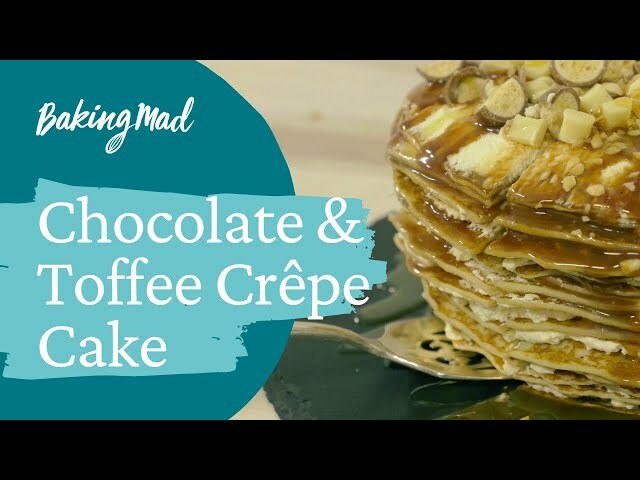 This creamy layered crêpe cake is so simple to make and looks so intricate. You'll please the whole family with this one and you don't even need an oven! Mix the flour, salt, eggs and milk to form a batter. Ideally leave to stand for 30 minutes. Grease an 18cm/7 inch pan with butter lightly. Spoon 2 tablespoon of batter in a heated pan for each pancake and swirl the pan so that the batter covers the pan. Cook for 1 minute each side. Aim for 20 pancakes in total. Whip the cream with the icing sugar until it is stiff but not over whipped. It needs to be spreadable but not too soft that it squishes out of the pancake layers. Layer the pancakes with the cream, spreading a fairly thin layer between each one until they are all used up. Take care to keep the stack straight. Finish with a layer of cream on the top. Top with your favourite decorations and finish with a lashing of Askey's Treat Sauce.